A new menu for autumn, a new location in Ballinger for 2 nights. Friday 26 & Saturday 27 September. FULLY BOOKED. At the end of September, with the nights drawing in and a chill in the air, we’re going for a 3 course plus amuse bouche menu similar to the events I cheffed at Temperance. Except it won’t be in the Temp, as they are booked all month in preparation for their September theatre event. So the Duende team is heading over to Ballinger, to their lovely memorial hall, where we’ll create the same atmosphere and buzz of the recent Duende evenings. This event is a Bring Your Own wine (no corkage charged) and bring your own cash – we don’t take cards. There will be 4 options for each course, and as always one is a veggie option for each course. These options will be marked on the menu when it’s released just before the event. This event is £30 per head for 3 courses plus an amuse bouche. Email me if you’d like to see samples of previous event’s menus to whet your appetite. Email duendereservations@gmail.com to book. We need to take a deposit of £10 per head for tables of six or more. Bookings of two are seated communally for a friendly, sociable vibe. Any questions, fire away. 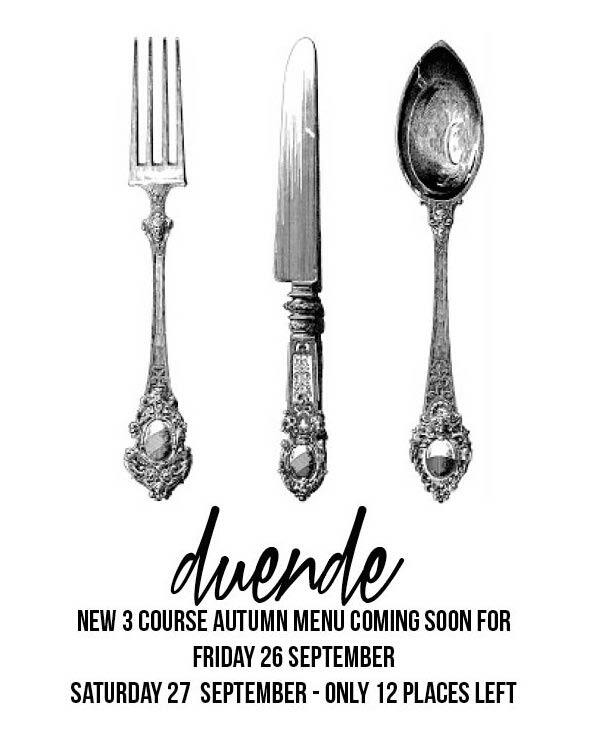 Next Post Duende returns to The Temperance Hall in October. Three course menu, plus amuse bouche.